Born 8 May 1818 in Gagetown, New Brunswick; died 20 June 1896 in Saint John, New Brunswick. Samuel Leonard Tilley was a pharmacist by trade, and entered politics through involvement in the temperance movement against alcohol consumption, tied to his devout religious belief. Elected to the New Brunswick Assembly in 1850, Tilley became provincial secretary in the Reform government of 1854, under the leadership of Attorney-General Charles Fisher. By 1861, Tilley was premier of New Brunswick, becoming a strong proponent of an intercolonial railway line to link the Maritimes with other parts of British North America, as a step toward political union. When Canada's Great Coalition of 1864 opened the prospect of a union of all British North America, Tilley favoured the wider union as against a union of the Maritime Provinces alone. He seconded Macdonald's chief motion in favour of federal union at the Quebec Conference of October 1865. Returning to New Brunswick after Quebec, Tilley faced popular opposition to Confederation, and with his mandate set to expire in June 1865, pledged that Confederation would not pass before an election was held to determine the will of the people. In the ensuing elections, Tilley was defeated in March 1865, the anti-Confederation Albert Smith taking power, and Tilley himself losing his seat. 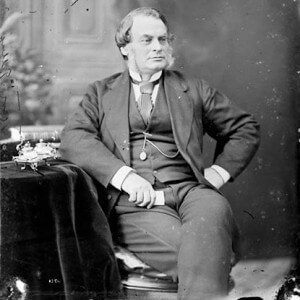 But in April 1866, Smith resigned, after New Brunswick's Governor accepted a vote in New Brunswick's unelected upper house signalling support for Confederation - Smith attempting to make an issue of vice-regal interference in politics. Tilley campaigned for Confederation, returning to power with his cause helped by financial support from the Canadian government, and security concerns raised by the Fenian Raids. For more on Tilley refer to the Dictionary of Canadian Biography.